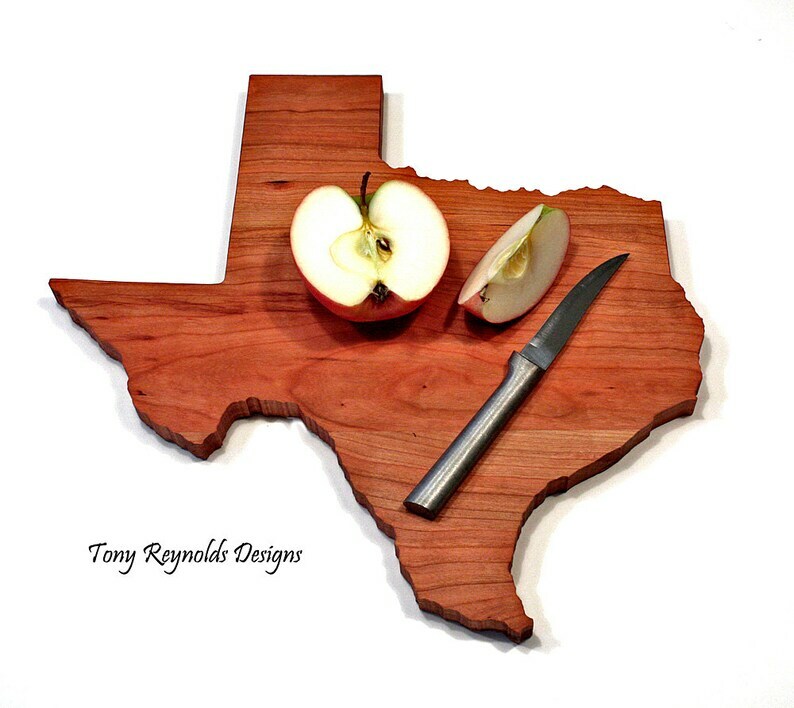 Our Texas State cutting board makes a great item for personalized gifts for Wedding gifts, Christmas gifts, Birthdays, Housewarming gifts, Hostess gifts, or just about any other gift giving occasion. The perfect gift for the foodie on your list! Holding true to the original spirit of ETSY, we still make all of our cutting boards one board at a time using locally sourced hardwoods! Our State of Texas cutting board is handmade, heirloom quality and made from beautiful solid Cherry hardwood. It measures approximately 13″ by 13.5″ overall and is 3/4″ thick. The finish is 100% FDA approved as food safe. We use our own special blend of mineral oil, beeswax and carnuba wax to seal the board and give it a beautiful luster. Handmade by Tony Reynolds Designs in Granville, Ohio USA. It ships with care instructions in a nice white box suitable for gift giving and or wrapping. All of our State of Texas cutting boards are made by special order, so please allow 10 to 14 days for your board to be custom made from the time you place your order. We ship via USPS Priority Mail which typically arrives within 3 days of shipping. Very good quality. It is as pictured! My bestie loved it as her gift.